Cuba, Land Of The $250,000 Family Sedan : Parallels For the first time in five decades, the Cuban government has begun selling new and used vehicles to anyone who can afford them. But with used Volkswagen Passats priced at $70,000 and a 2013 Peugeot sedan priced at $250,000, it's pretty clear the Castro government doesn't really want to sell them. Why? Cubans peer into the windows of a car dealer in Havana on Jan. 3. Cubans were astonished by a $250,000 Peugeot family sedan and other prices when the government lifted its 50-year restrictions on new and used car sales. For the first time in more than 50 years, the Cuban government began selling new and used vehicles last week to anyone with the money to buy one. And as crowds gathered at state-owned car lots in Havana to check out the inventory, a consensus quickly emerged. The cars on sale had either been priced by callous, greedy idiots, or the Cuban government had become the most incompetent automobile retailer in the world. How else to explain 2013 Peugeot sedans priced at more than $250,000 — seven or eight times their retail value in Europe? Or used vehicles like a 2010 Volkswagen Passat offered at $70,000? Even Chinese-made Geelys — some of the world's cheapest cars — are listed at more than $30,000, somehow increasing in value after absorbing years of abuse as tourist rentals on Cuba's pothole-rotted roads. 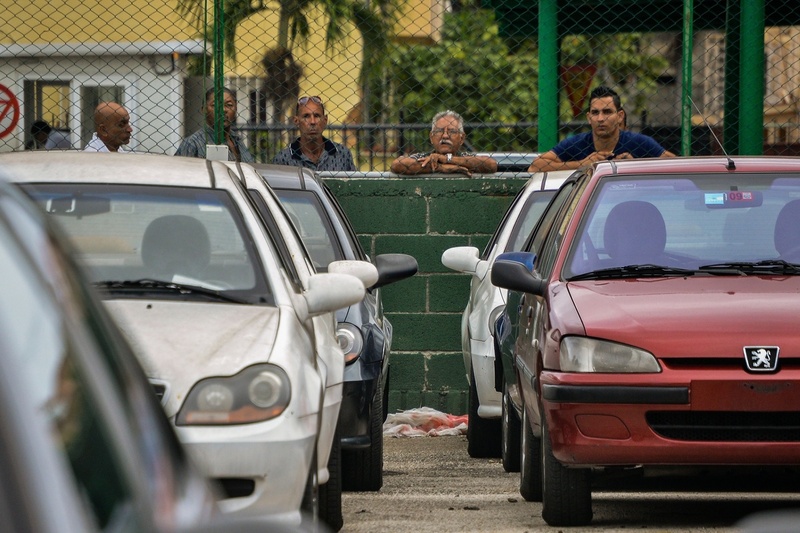 Cubans look at new and used foreign-made cars for sale at a car dealer in Havana on Jan. 3. All of this is especially baffling in a country with miserable public transportation and average state salaries stuck at $20 a month. "A doctor! Someone call a doctor!" shouted one man, feigning a heart attack, as he read the list of used vehicle prices aloud to rounds of laughter at a government car lot in Havana's Miramar neighborhood. Because the communist government often neglects to explain the reasoning behind some of its more extreme measures, there's been little else for Cubans to do but joke in public as they seethe in private. Only the reality is that the Cuban officials managing the island's state-run economy may have a very good reason for listing brand-new Peugeots at Bentley prices: They can't actually afford to sell them. It's the same fundamental problem that leads the government to place exorbitant markups on other costly imported goods, according to Cuban business executives who have worked inside large state firms. When the Cuban government imports new cars, for instance, it must pay for them in hard currency — typically U.S. dollars or euros. But when it sells a new car on the retail market, it receives payment in Cuban convertible pesos (CUC), a currency that has no foreign exchange value at all. In other words, the Cuban government is in the business of buying items in hard currency abroad and getting worthless money in return. Not a good business model. This is true of televisions, refrigerators and just about any other imported item whose retail sales are monopolized by the Cuban government. This wasn't such a problem when the government allowed U.S. dollars to circulate freely on the island between 1993 and 2004. But it's a major liability now that the CUC is the only legal tender for such goods. While the government must maintain a certain level of inventory at its stores in order to get Cubans and visitors to trade in hard currency for CUCs, it can't afford to sell large volumes of imported items and constantly restock its supplies. That would drain the government's scarce foreign reserves even further. The result is a badly distorted business model in which the government needs to offer just enough retail products to entice consumers to exchange hard currency, while keeping prices steep enough to discourage high volumes of sales. And there is a large, pent-up demand for cars on the island, even at big markups, because the government has tightly restricted sales for decades. In other countries whose currencies have little or no exchange value on international markets, big-ticket import items like cars are often priced in U.S. dollars or euros. But because the communist government is the exclusive retailer and the sole banker on the island, there's essentially only one pool of money to draw from. 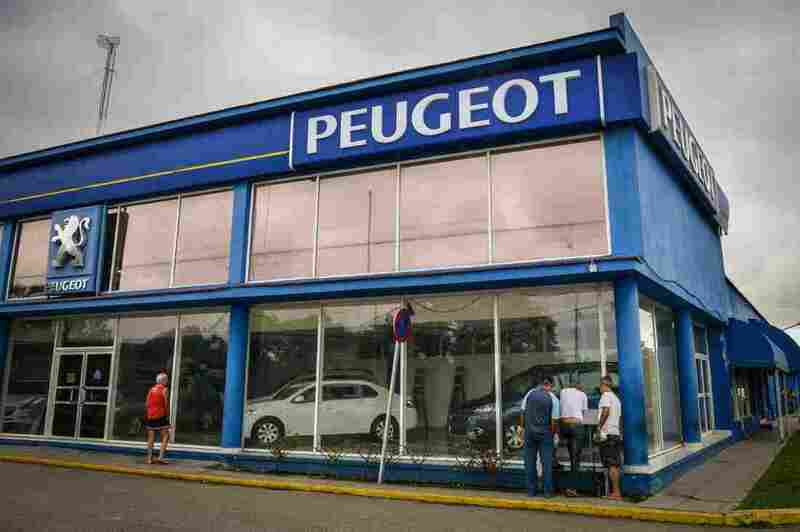 If a would-be car buyer goes to a Cuban bank and trades in $250,000 in U.S. dollars to get enough CUCs to buy a new Peugeot, that's a great deal for the government. But a more likely scenario is that the few Cubans who could pay such prices belong to the small class of business owners, artists and wealthy farmers who have stockpiled large amounts of Cuban currency and need somewhere to spend it. According to Pavel Vidal, a Cuban economist and former monetary policy adviser at Cuba's Central Bank, the reform process initiated by President Raul Castro will continue to expose some of the island's most glaring "distortions." "These distortions originate from a closed economy that is monopolized by the state," he said, "and dependent on state companies with very low productivity that survive by paying extremely low salaries and charging extremely high prices by taking advantage of their monopoly power." Most galling to Cubans: the prices set for used cars — typically decommissioned from state-owned rental fleets — that have taken a torch to the Kelley Blue Book. A tiny 2011 Kia Picanto? $43,000. A 2009 Hyundai Santa Fe SUV? $90,000. For years, Cuba has been importing Korean Hyundais and Kias, or French Peugeots and Renaults, then turning a huge profit by renting them to tourists. The cars are always in high demand despite rental rates that are often double what they would be in the rest of the world. And by offering something tourists wanted, the rental cars have been key hard-currency generators for the government. Once the cars accumulate high miles and wear and tear, the government typically has sold them to Cuban professionals at rates closer to the market value. But authorization to purchase such a vehicle was highly coveted and used as a reward for Cuban doctors, for instance, after completing years of service on a so-called international mission in Venezuela, Angola or one of the other countries where Cuba sends medical professionals. Thus, a worn-out rental car also satisfied a political goal, by keeping Cuban professionals motivated to go abroad. Why the government would now price used vehicles at such exaggerated levels is beyond comprehension, said Cuban economist Juan Triana. "I can't see the reasoning," he said. Others have surmised that the car prices are an early indicator of the government's plans to devalue the CUC before its elimination this year in favor of the island's other currency, the Cuban peso. And apparently there are some Cubans willing to pay otherwise insane prices to unload their stockpiled CUCs. Employees at one state used car lot told the BBC last Friday that six vehicles were sold on the first day, including one for $50,000.